I will preface this post by saying we have NOT had winter yet. It’s January 31, 70+ degrees in Atlanta, and our windows are open. However, our grocers have not received the message and our markets have plentiful amounts of winter vegetables. This recipe is delicious no matter the temperature outside. Any winter vegetables would be great for this. This recipe is what I had on hand. This recipe is wonderful for using up all the “bits and pieces” you have left in your refrigerator. Prepare the vegetables and place into a medium sized bowl. Mix the remaining ingredients and pour over the vegetables. Toss well, making sure everything is coated. Spread in a single layer onto a baking sheet. Preheat oven to 375 degrees. 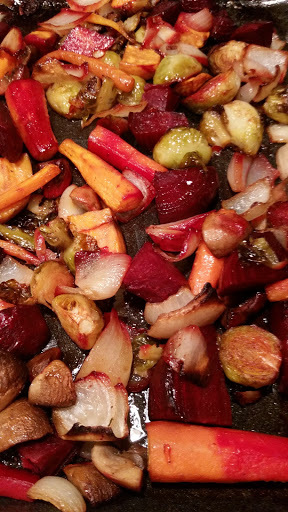 Bake for 30-45 minutes until the vegetables are fork tender and lightly browned. This is delicious and even fantastic as leftovers the next day. I served this with an extra drizzle of the Balsamic Vinaigrette and a sprinkling of feta cheese…..yummm!